Autumn is the time to knit and crochet! 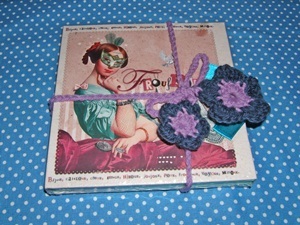 For every purchase of wool or a DIY kit you will get the pattern of two crochet flowers for FREE. This special offer is available until October 7th 2012. With this free pattern you will get two different types of crochet flowers, a bigger one and a smaller flower.Each of the flowers has five blossoms. These crochet flowers are rather versatile, use them as decoration for your felted bags, to prettify a gift or to decorate special gift vouchers, like our mother's day vouchers. You can make your flowers with wool from the mountains of Salzburg we have in our shop, as we did, or use cotton, linen or other fibre. The size of the crochet hook is all up to the way you prefer it. Felt Bag Xenia in brown mottled with cotton crochet flowers. Our Hobo feltbag Xenia is easy to knit and after felting (a service kindle done by the washing machine) you can decorate it with pretty crochet flowers. 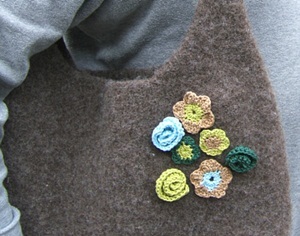 To have a felted bag that is easy to wash we recommend to use crochet flowers made of cotton. You can as well make wool flowers and felt them in a separate bag when felting your knitted bag, you stitch on the flowers to your felted bag afterwards. Two crochet flowers in between them a long string of crochet chains – this makes a beautiful and individual ribbon for decorating a present. With this flowery ribbon you can prettify all gifts. You can use flowers with a colour scheme matching the gift wrapping paper. By the way, our gifts which are usually decorated with crochet flowers or crochet hearts are easily recognized by the gifts, even without greeting card attached to the gift. 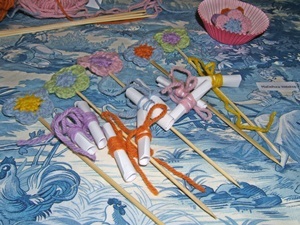 When using crochet flowers you will get everlasting flowers and you could even arrange them to form a bouquet of flowers. You can even hang small messages on their stem. We presented our mother's day gift vouches on such everlasting flowers. The crochet flowers are pretty on hats and caps, they adorn pullovers and jackets and you could wear them as flower brooches. You can definitely think of many more occasions to use them. 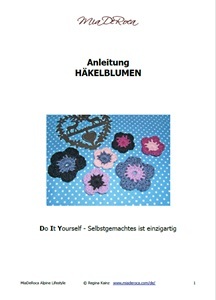 Order now one of our patterns and DIY kits add a few skeins of wool and the crochet flower pattern will be shipped to you with your order – until October 7th 2012. We have knit and crochet projects in our patterns section, DIY kits with instructions and wool and eBooks. Choose between felted bags, from shoulder bag to fancy baguette bags with stripes, exceptional cases and wraps like our carrot-gift wrap as well as different crochet advent calendars, ideas for decorative garlands or maybe and individual case for the smartphone.